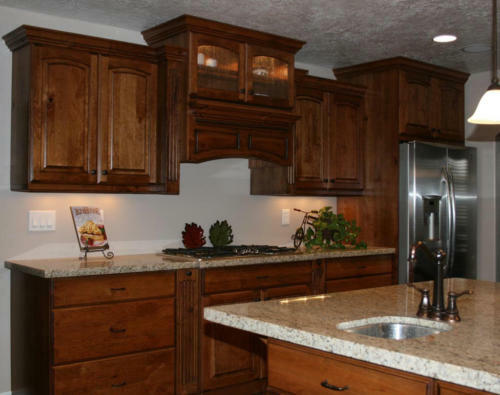 Professional cabinet refinishing is the most inexpensive way to give your cabinets a new lease on life. I've had many customers who have refinished their cabinets for the sole purpose of making it easier to sell their home. A newly refinished kitchen not only adds tremendously to the value of your home it also makes it much easier to sell. Painting, has the ability of making even the most raggedy cabinets look like new. Many people who are happy with the color and style of their cabinets find that for a very reasonable cost they can refinish the doors and drawers only, (where most of the wear and tear takes place), and remove years of use, and make their cabinets look like new again. Refinishing can be an economical and easy answer to your kitchen remodeling questions, I've seen hundreds of kitchens transformed with a new countertop, a new floor and refinished cabinets. One of the latest trends is to combine painting and staining in different areas of the same kitchen cabinets, or stain in two different colors. You are only limited by your imagination! If you are not sure which color to select, your paint professional may offer color consultations, or you may want to get advice from an interior designer. 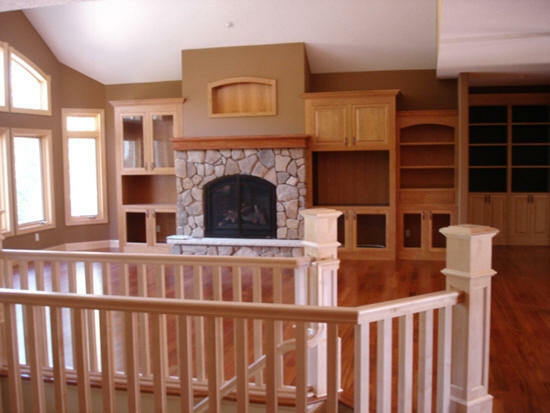 For the best results, a professional should paint or stain the cabinets. Not to mention that a professional job will last for many years, probably longer than the finish you currently have. Of course, this will depend on the amount of traffic that goes through the kitchen. Just as the painted wood work and doors in your home need periodic painting, so the kitchen cabinets will also need maintenance. An advantage to painted cabinets is that any nicks or worn areas can easily be touched-up, thereby extending the life of the paint job. A small to medium kitchen will take about four days. Larger jobs will take from three to five days. If you have other dark wood work in your home—such as your bathrooms vanities, doors, casings, base, etc.—these areas can be painted at the same time as your cabinets, giving the whole house a new look. Painted kitchens have been very popular for a number of years now. Painting a kitchen has many advantages; major defects in the existing cabinets can be easily covered in the painting process, handles or knobs can be moved to a new location, whereas that would not usually be possible when a kitchen is stained. Also a kitchen painted white or off-white will seriously brighten a dark room, give a cleaner and more spacious look. Or something very popular now is giving any cabinet the stained appearance of wood, this can be done any color of stain. The process of this is made by painting the cabinets a base color, usually this means priming all the cabinets with a base primer, afterwards the color of the stain is chosen ( there are thousands of stains to choose from) and different styles of cabinet looks. Once we have applied the first coat of jel stain to the cabinets it will be sealed with a sanding sealer. Once the sanding sealer has dried we will apply another coat of jel stain to the cabinets, giving it more perception and the right look depending on your style. After the second coat of stain another coat of sanding sealer is applied to seal of the second layer.. There is light sanding in between all these coats.. Once we get the right appearance, we apply two coats of lacquer sealer to all cabinets to give them the right sheen finish and appearance. In most situations chemical stripping of all the existing finish is not necessary to paint cabinets, if the original finish is sound. An excellent chip resistant finish can be obtained by cleaning and vigorously sanding the existing finish before priming.. Of course if the existing finish is not sound it will need to stripped down to the bare wood before priming. My many years of experience makes it possible for me to readily determine the quality of an existing finish. Many people ask me about a painted finish, "will it chip?" Most of the time when people ask me this question they are thinking about an experience they had or someone they know has had with a painted finish that readily chips, invariably this is caused by poor preparation of the surface to be painted over. I guarantee my painted finishes against spontaneous chipping due to improper preparation. Of course any finish if hit hard enough will ding and chip. 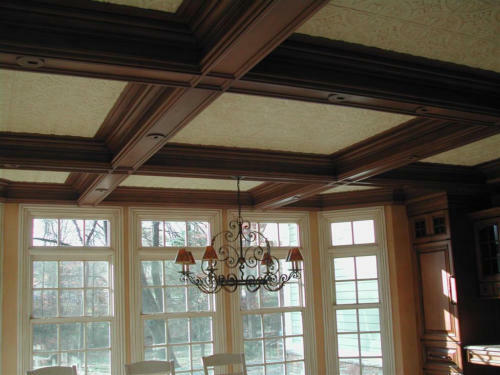 Many decorative effects can be achieved during any cabinet refinishing project, especially with paint. A different color on the doors or a crackle finish is just a couple of examples. The overall look and feel of your kitchen or bathrooms can be dramatically changed and improved by either revitalizing the current finish or refinishing with paint or stain. Painting Cabinets: Painted cabinets can add a new look and style to an otherwise dreary kitchen or bathroom. A tough scratch resistant finish is possible, resulting in an entirely new look that is easily maintained. All of this for a fraction of the cost of a new set of wood cabinets or vanities. Use Glazes for a Decorative Effect: Using a glaze over paint is a great way to highlight details and give the cabinets a unique look. A glaze can be used for an aged look to newly painted cabinetry. Apply a Crackle Finish to Cabinets: This is a popular way to create a new and different kind of look. Crackling can be a bold statement or a subtle change with the right choice of paint colors. Add some glazing and crackling can take on the look of very old cabinets. Antiquing Cabinets for a Unique Look: This involves distressing an existing finish or antiquing can be combined with new stain. Many unusual effects are possible. Revitalize Your Current Finish: If you like the current look of your kitchen or bathroom, the finish can be revitalized to look new again. Stained cabinets can be brought back to life with just a little elbow grease, the proper materials and some good tools. 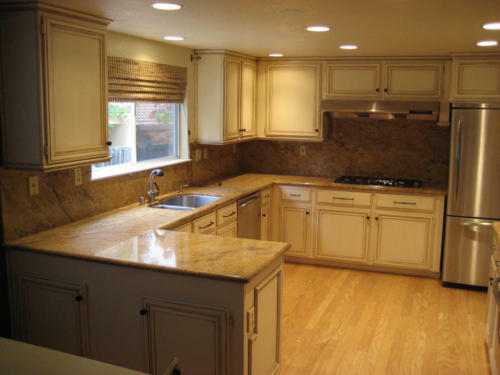 Refinishing kitchen cabinets is one of the most popular and cost effective refinishing projects for both the homeowner and professional painter. Restain Over the Existing Finish: Retaining over existing finishes is another possibility. This typically involves the use of a gel stain and can produce dramatic color changes, especially with light stained cabinets. Re-staining cabinets is an excellent alternative to replacing or re-facing. Re-staining cabinets using gel stain over a preexisting wood finish is also an alternative to stripping and sanding down to new wood.